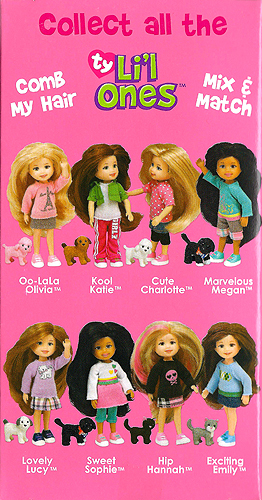 Li'l Ones are miniature plastic versions of the popular Ty Girlz. The Li'l Ones are small enough to be carried in a book bag, purse, lunch box or shirt pocket. Ty shipped the first Li'l Ones to retailers in the USA in February, 2010. There were eight different dolls. Each doll came in a pink box that also included a miniature, plastic pet. 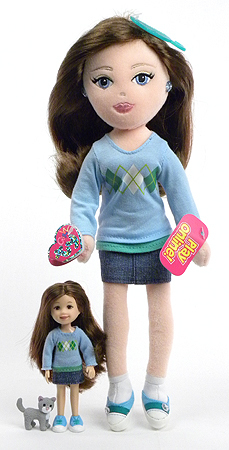 Li'l Ones are approximately 4.5 inches tall, compared to their Ty Girlz sisters who are approximately 12 inches tall. 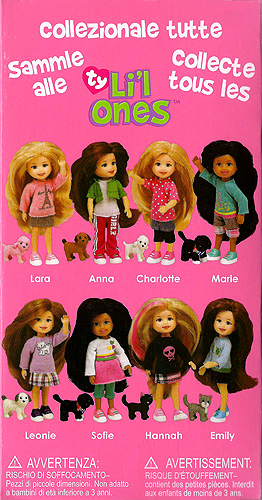 In June 2010, Ty released the eight original USA Li'l Ones in the UK, but six of them had different names. Each of the Li'l Ones in the UK came with a small, plastic hair brush. Ty introduced six new Li'l Ones on January 1, 2011. They shipped to USA retailers in February of that year. This new group of Li'l Ones included Ty Boos as pets, as well as licensed characters Snoopy and Hello Kitty. Each doll also came with a small, plastic hair brush. The new Li'l Ones (left to right, below) were Beautiful Bella, Hello Kitty, Sweet Sophia, Pretty Peyton, Awesome Abby and Snoopy. In July 2011, more renamed Li'l Ones showed up on retailer shelves in Germany.